This all-inclusive kit offers professional quality for a wide variety of graphic arts, hobby, craft, quilting, and industrial applications. The kit contains a reversible, self-healing cutting mat, an art knife, and spare blades. 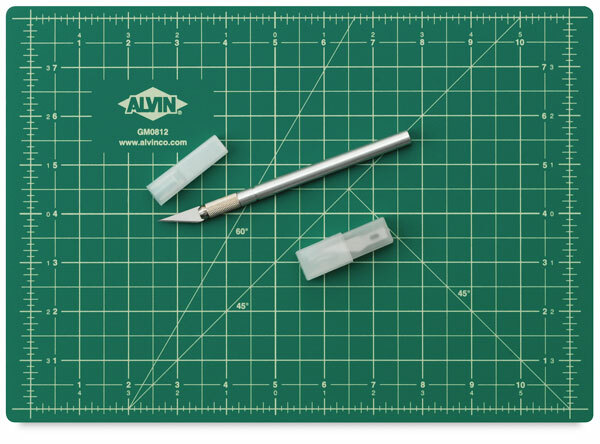 Alvin's extra-durable, extra-thick GBM Series cutting mat measures 8-1/2" × 12" (22 cm × 31 cm) and 3 mm deep and is made from a unique composite vinyl material designed for both rotary blades and straight utility blades. 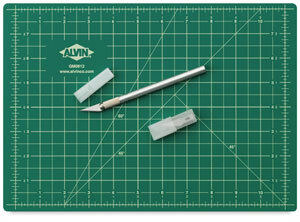 The mat's long-lasting, non-glare surface can be cut and slashed repeatedly without displaying marks or cutting lines. The reversible mat is green on one side and black on the reverse. Both sides feature a printed grid pattern that includes guide lines for 45° and 60° angles and 1/2" (1.3 cm) grid lines. All four edges are fully numbered and graduated with 1/8" (3.2 mm) hash marks that extend beyond the zero base line. The mat's non-stick surface is impervious to abrasions and liquid spills.